My old house had this concrete porch on the front which I hated. I always wanted to cover the bottom in brick. But this is also a pretty cool idea if you too have not-so-pretty concrete in front of your home. 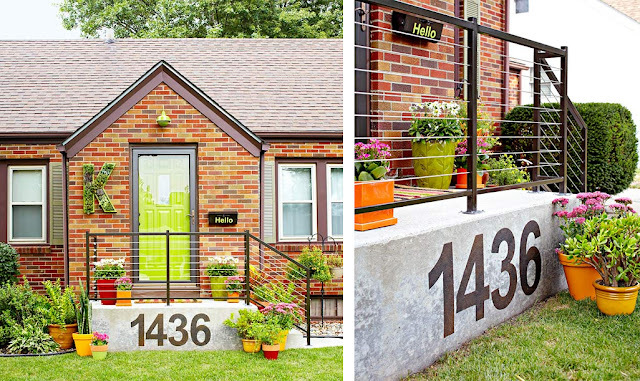 It was done by making stencils of the numbers then using a foam pouncer, stencil with outdoor paint. I wonder if a concrete stain would work as well? The homeowners combined black and earthy brown paint to achieve a mottled look for the numbers. That is a cool idea, especially if you did it in a fun font. And as a civil engineer, I am so glad you said concrete and not cement because they are not interchangeable (it's like nails on a chalk board to me!). You could also do the "moss letters" idea. Mix moss and yoghurt (I think, but double check) and then "paint" it on in the shape you want. If the front of your steps is in the shade, it may grow that way. I love this idea as I have a concrete porch just like that! Plus I love the railing too as I have a loose ugly curly rod iron one that I detest. I painted it but I still don't like it! LOL! This is so fresh! I wonder what's on the "K"? Is there moss or herbs growing on it?